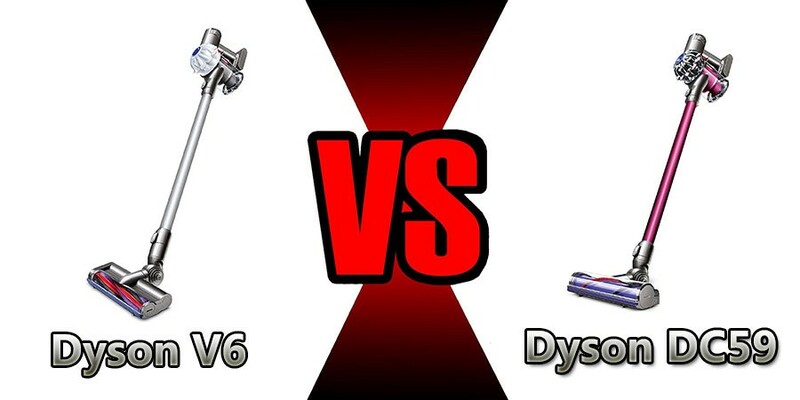 Home » Dyson V6 vs DC59 – What Has Changed In The Dyson Vacuum Models ? Dyson V6 vs DC59 – What Has Changed In The Dyson Vacuum Models ? 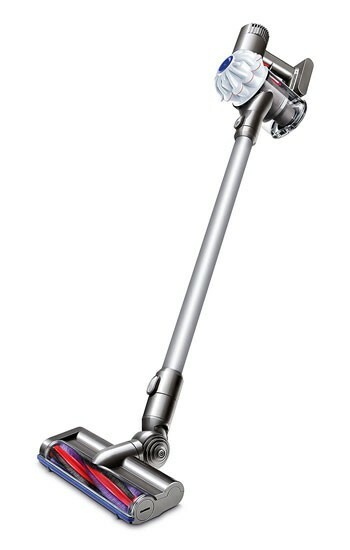 Dyson V6 appears to be a makeover of the DC59 range. But if you peek behind the curtains, Dyson has made some game changing alterations in the V6 line. What are the similarities between these two series? What are the main differences? Which will be a better choice for you? Before you hastily spend your hard earned money on any vacuum cleaner, read our Dyson V6 vs DC59 in-depth review and comparison guide. The DC59 made its debut in 2012. It is a cordless stick vacuum cleaner with recharging facilities. The DC59 can be converted into a handheld, which is one of the most alluring features of a Dyson. When in its stick form, the dimensions of this model are measured 9.8” wide x 47.8” high x 8.2” long. It uses Dyson’s trademark Cyclone technology, housing 15 cyclones arranged in 2 tiers. There are a couple of variants of the DC59 – the Motorhead and Animal among them. They each include an extension wand, a crevice tool and a combination tool. The DC50 Motorhead features a direct drive cleaner head to earn its name. The cleaner head in question has a motor placed inside the brush bar for an enhanced performance. The Dyson V6 was branded in 2014. It too is a cordless stick vacuum that makes use of the Cyclone technology. Its dimensions are – 9.8 inches wide x 47.5 inches high x 8.2 inches deep. It too sports the versatility of converting into a handheld. 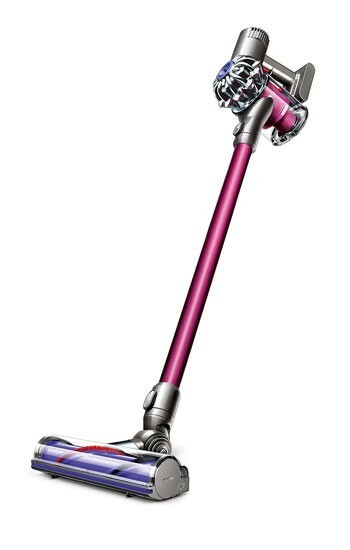 Dyson first introduced the soft roller cleaner head in the V6 range. The cleaner head sort of revolutionized the vacuuming of hard floors. More on that later. Dyson V6 has a total of 10 variants. All of them have motorized or direct drive cleaner heads. To be honest, the DC59 and Dyson V6 have more similarities than dissimilarities. We will learn them first so you can get a better picture of what is going on with this rebranding. Both the Dyson vacuum cleaner ranges run the Dyson digital motor. The V6 digital motor is an improvement from the motors the earlier Dyson models contained. It has a maximum output of 100 air watts. At normal mode, however, the motor can pump up to 28 air watts. The bin capacity of both the DC59 and V6 are 0.12 gallons. It is bigger than what the earlier Dyson’s had, no doubt about that. But it still proves to be inadequate every now and then. Perhaps to make up for the bin volume, Dyson has made emptying the bin very simple and hygienic. You put the dust cup over a trash can and only one push of a button is required to get this done. Press the release button and watch as the bottom of the bin opens to dump dust into the trash can. No physical contact with the wastages in needed. Both the DC59 and V6 have toggle switches to choose the power setting you wish to clean in. There is the normal suction mode. It provides a gentle suction and lasts longer. For delicate surfaces like bare floors, it is very useful as it prevents causing any damages. Then there is the boost mode. It provides the maximum suction the motor is able to produce. While cleaning thick carpets or stubborn debris, this feature is a lifesaver. Dyson V6 and DC59 both house the same Nickel manganese cobalt battery. It was re-engineered from the batteries of the previous models. The runtime of both vacuum cleaners is pretty much the same as well. In the normal setting mode, the devices can run for up to 20 minutes. If you attach additional motorized tools, the runtime is reduced to 16 minutes. In the max setting mode, the vacuum cleaners provide maximum suction for about 6 minutes. Both the batteries require about 3.5 hours to fully recharge. When you consider that, the runtime is not impressive in the least. Dyson V6 and DC59 both have a set of common tools – the combination tool, crevice tool and extension wand. Dyson has included additional tools with the many variants of the V6 range. We will talk about that in a while. But Dyson has also kept these common tools in the rebranded V6 because maybe they will never go out of style. The extension wand explains itself. The combination tool uses a combination two different brush types into a single tool for cleaning jobs that require greater versatility. The crevice tool cleans under and behind furniture; in general the hard to reach spots. Both ranges offer a docking station that not only charges the batteries but also store these tools. 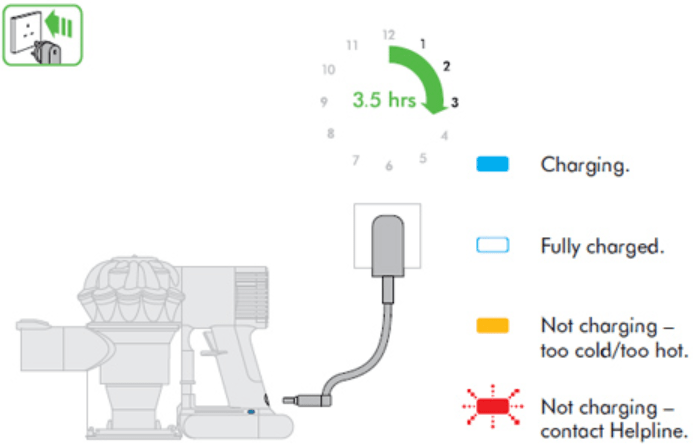 If there are so many similarities, what are the improvements in Dyson V6? Are the new changes sufficient? Was rebranding the DC59 really worth it? In the previous segments, we have drawn the framework for our Dyson V6 vs DC59 analysis. Let’s dive in and find some answers! Be informed that the DC59 has washable filters that are supposed to last the lifetime of the vacuum cleaner. Very well, but these filters are not HEPA. In the V6 range, Dyson placed a post motor filter which is HEPA! Hyper efficient particulate air filters capture the tiniest dust particles and remove allergens from the air you breathe. For people with allergies or a high sensitivity to air, a HEPA filtered vacuum cleaner would be the way to go. These HEPA filters are washable, lifetime filters as well. Another convenient detail about the V6, you do not have to remove the dust cup anymore to get access to the filter. Dyson V6 offers a wider cleaning path than the DC59. It allows the vacuum cleaner to cover more surface area and pick up more with the same number of sweeps over the DC59. In the DC59 range, the direct drive cleaner head was present in only the Motorhead variant. Dyson has taken inspiration from that and made changes in the V6 range. Except for the V6 Cord-free, all the V6 variants feature the direct drive cleaner head brush. The V6 Cord-free, however, still sports a motorized cleaner head. The motorized cleaner head provides a sufficient vacuuming on all surfaces. The V6 claims to have suction that remains powerful throughout the entirety of its runtime. We found it to be a true claim. As it happens with many other vacuum cleaners, the vacuum cleaner loses its suction power as the battery begins to drain. We witnessed the V6 maintain a powerful suction from the beginning to the end of our cleaning session. No fading. In the DC59 line, only the Animal variant had a mini motorized tool. In the V6 ranges, this tool accompanies many variants. The mini motorized tool is an attachment for tough jobs. Be it carpets, upholsteries, stairs or car seats, this tool will dig its way in on any of these surfaces and pick up fine dust and hair. Homes with pets could gain a good lot of benefits from a Dyson V6 vacuum cleaner. None of the DC59 variants had this attachment. The soft roller cleaner head is a brush roll made of really soft material. It is useful for cleaning tiles, laminates, bare and hardwood floors. Bare floors need to be cleaned with care because they are expensive and sensitive. The soft roller cleaner head gently sweeps over the bare floors without ever leaving a scratch. Final Words – Was the Makeover for Better or for Worse? Dyson took inspiration from the popular features of the DC59 but also was not blind to its flaws. They made changes wherever they felt it was needed and kept what won the hearts of their customers. No one can deny that the rebranding was successful. Dyson V6 range is one of the most popular entry-level vacuum cleaners in the market. It appears that Dyson had been paying attention all along! The makeover was a smart strategy and we definitely recommend the Dyson V6 over the DC59.